maintain and control power from solar panels into many battery systems. The Victron energy products from deliver an ultra fast MPPT signal to improve battery performance. This is known as the maximum power point tracking. These particular controllers are used to maintain energy from the suns irradiance quickly and efficiently. Ideal when cloud conditions are changeable throughout the day, thus maintaining high performance in changeable conditions. This provides over temperature protection and intelligent automatic load shedding power management. As the MPPT charge controller is more complex in its makeup. This enables more than 30% improvement in energy harvesting, than standard control units. By using its micro processor brain, the controller can automatically adjust its optimum voltage point. 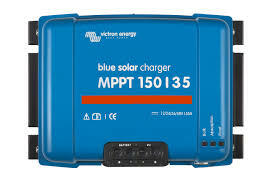 Which can then provide maximum voltage via the MPPT configuration. By increasing incoming cell voltages by connecting solar PV system panels in series. You will improve the performance of the MPPT charge controller as, it can adjust automatically providing you do not over load the voltages or currents. We provide a variation amp and voltages delivering a range of sized controllers. These can be used specifically to adhere to the optimum values of many solar panel designs. MPPT battery charge regulation control can be controlled through the Victron smart phone dongle. This dongle will provide you with full management of the Victron charge controller. This is connected into the socket on the underside of MPPT charge controller. Where connection is available via the VictronConnect app.